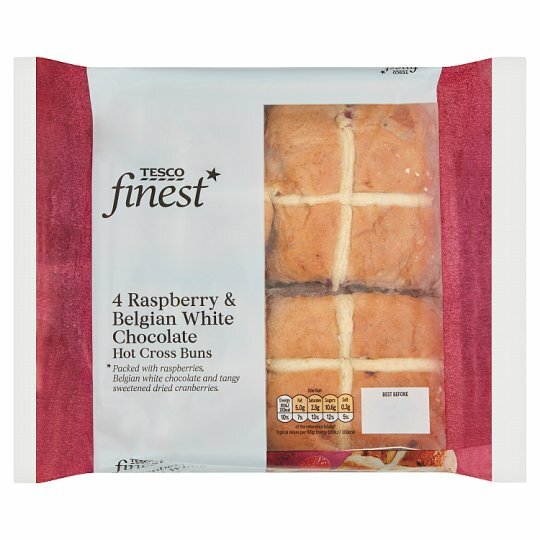 4 White hot cross buns with Belgian white chocolate chunks, raspberries and sweetened dried cranberries. Packed with raspberries, Belgian white chocolate and tangy cranberries. INGREDIENTS: Wheat Flour [Wheat Flour, Calcium Carbonate, Iron, Niacin, Thiamin], Belgian White Chocolate Chunks (14%) [Sugar, Cocoa Butter, Dried Whole Milk, Whey Powder (Milk), Milk Sugar, Emulsifier (Soya Lecithins), Flavouring], Water, Raspberries (9%), Sweetened Dried Cranberries (6%) [Cranberries, Sugar], Sugar, Butter (Milk), Lemon Peel, Yeast, Wheat Gluten, Salt, Potato Dextrin, Emulsifiers (Mono- and Di-Glycerides of Fatty Acids, Mono- and Di-Acetyl Tartaric Acid Esters of Mono- and Di-Glycerides of Fatty Acids), Flavouring, Rapeseed Oil, Palm Oil, Flour Treatment Agent (Ascorbic Acid). For allergens, including cereals containing gluten, see ingredients in bold. Also, may contain peanuts, nuts, sesame seeds and egg..